With numerous Argentinian and foreign festival fanatics attending the previous edition of Armada Beach, a return to Mar Del Plata, Buenos Aires was apparently only a matter of time. 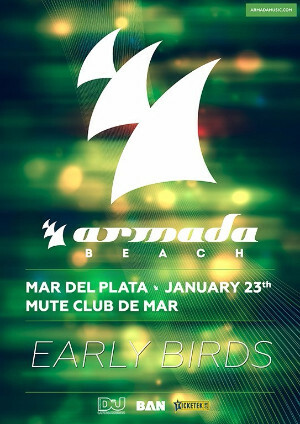 Just over one year after the previous Armada Beach event on 4 January, the event returns to Mute Club de Mar, once again bringing along various big name artists. Twenty three January 2016 marks the brand new edition of Armada Beach, promoted by Dutch record label Armada Music. This year’s edition marks the fifth consecutive allotment of the event to the Mute Club de Mar. Previous editions featured headlining artists including Aly & Fila, John O’Callaghan (2012), Markus Schulz (2013), Dash Berlin (2014), and once again Aly & Fila in 2015, complemented by additional acts such as Andrew Rayel, Cosmic Gate, Heatbeat, and Orjan Nilsen. This year’s line-up has still to be revealed but may be announced in the coming weeks. Tickets are on sale now.